So that's what all the mess was on my coffee table earlier ;-) It's a 4x6 book; the front cover is heavy-weight cardstock covered in a piece from one of those Ikea pillowcases. I didn't worry too much about keeping the corners tidy, I felt it wasn't necessary for this project! I ripped a piece of corrugated cardboard and painted a line of white acrylic, then when it was dry I flattened it slightly and stuck on some Basic Grey letters (I ran out of 'e's so did that old trick of using a '3'). I attached the strip to the front then added 3 orange buttons with green embroidery thread knotted through. 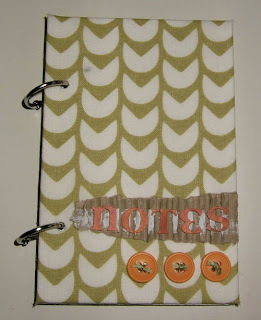 The inside cover is tidied up by attaching another piece of cardstock to hide the raw edges of the fabric. 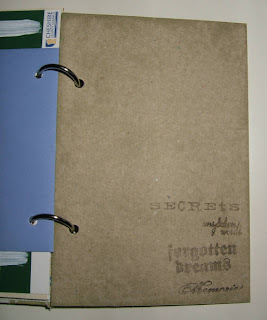 I also stamped the word 'journal' (PaperArtsy stamp). I didn't have quite the right colour ink, so I inked up in black, stamped onto scrap card, then inked again in Whisper Sage - perfect :-) See? 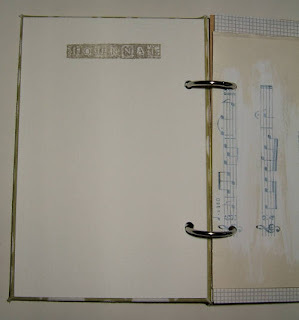 For old book pages, I dry-brushed over some white acrylic paint thinly, so you can still see the text in the background but my writing over the top will be visible. 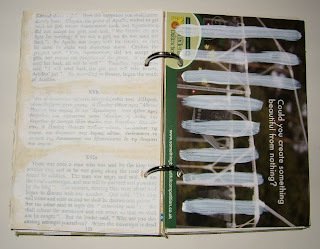 On the postcards and any other dark pages I painted thicker white lines to make sure the writing shows up. I'm really pleased with it - it's cute, it's small enough to keep in my bag (together with my camera) throughout September, and it uses up some more of the stuff that was cluttering up my living room... BUT!! Take another look at the top photo. You see that dirty mark, near the top book ring??? It appeared when I used my Crop-a-Dile to punch the holes, and I have no idea how! :-( Never mind, I can live with it, and I'm sure it'll look rather more worse for wear when it's been carried around in my bag for a while, but still - annoying! Hi. Visiting from Shimille`s. You got it all together! I haven`t decided on the size yet. Really like you album. Hi there, thanks for stopping by on 'life and scrapping'! Wow, you're al prepared for class, god job! My album is almost done, and i'm trying to share it later today! Have a good Sunday! Hi Humel. Your journal is looking fab & so is your blog. Mmmm Ben & Jerry's yum! Have fun. See you in class.